The Flatlands Motorama is an all new invitational pre 1968 Traditional Hot Rod and Custom car show in the Netherlands. It is being hosted by Henry Van Uden (Ford Brothers NL) and Miles Sherlock, the owner of JackHammer Hot Rod & Kustom Supply (UK). 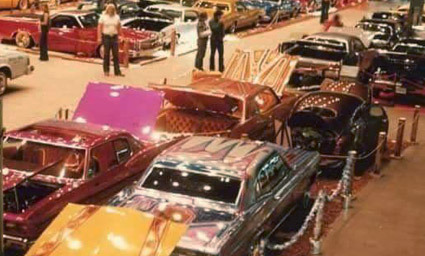 Henry previously had a very successful show in the Netherlands called Rockin' Jalopies which ran for 9 years. Miles and some close friend's put on the critically acclaimed Lead Room in Brighton in 2016 which was a small show dedicated to early custom car styles. He also was part of the team who ran the Hot Rod Hayride for seven years. 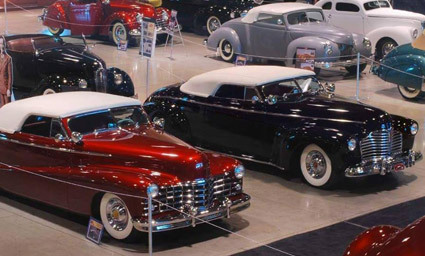 The Flatlands Motorama will be held at the Autotron Expo in Rosmalen which offers 10,000 m2 of indoor space over two floors to show off some of the best vehicles that Europe has to offer in this style. Along side will be an outdoor area put aside purely for hotrods and customs also. As well as the cars there will also be a selection of vintage Choppers, custom pickup trucks and a pre 78 custom Van show. So plenty of Eye Candy to fulfill everyone's desires. 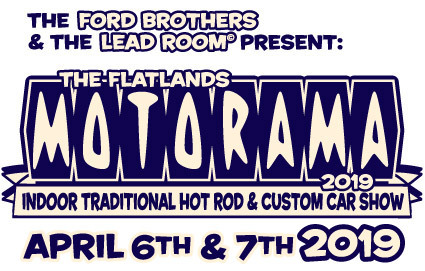 As well as the cars there will be the Flatlands Motorama Kustom Art Hangout hosted by Nefarious, where pinstripers, signwriters and low brow artists will be demonstrating their skills throughout the weekend. Traders will, of course, also be present selling all things for the Kustom community from Hotrod parts to clothes, jewellery and art so please support these guys and buy something cool to take home with you. There is various accommodation nearby with some being walking distance. The most popular will probably be the Dierenbos Vakantiepark which has cabins and lodges alongside a large camping area. They have a restaurant and mini supermarket on site as well as bowling alley and swimming pool. There are also plenty of hotels close to the Autotron. Advance tickets are available online priced at 10 Euros. If you wish to visit Saturday and Sunday, please purchase 2 tickets. Tickets will be available on each day priced at 12 Euros. Many of the artists present at the show contributed pinstriping to the painted panels to create a truly unique award. Copyright © 2018-19 - The Flatlands Motorama.